The weather had been amazing prior to this month’s C.R.A.S.H. lookout. 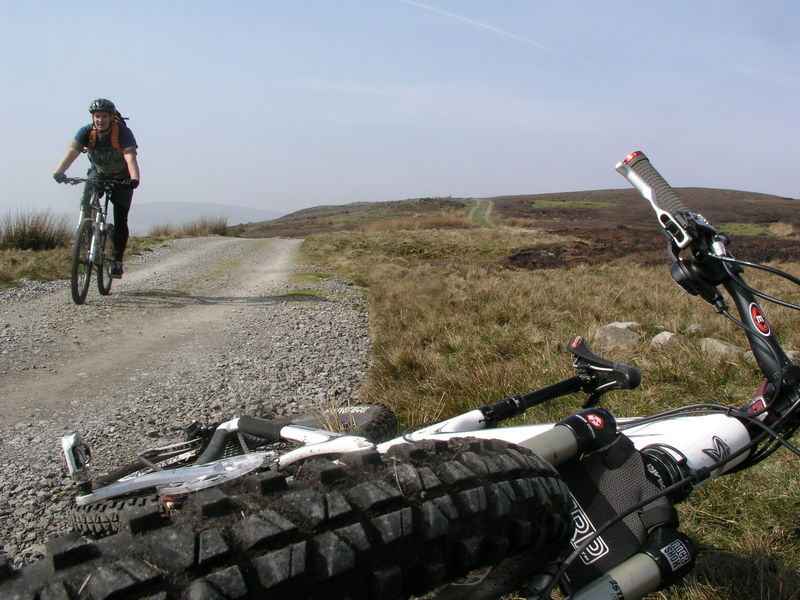 Craig and I managed to sneak a ride in from Reeth on Thursday when the sun had already dried the trails setting us up for a good ride at the weekend. I couldn’t wait to come back today. Setting away from home at 07:30 we arrived on the hour into Reeth on its cobbled market place come car park opposite the large green. The fog had seriously cut down the viewing pleasure on the drive but by the time we arrived we could feel the rising temperature beginning to burn the fog away leaving a sunny haze that frankly was out of character for March. My riding pals today were Tinkering Mick who hadn’t been seen out for months but is still riding to work on his Spesh Rockhopper and itching to get out on some proper trails. Keith, bringing the heat from Dubai returning to Sunderland has been looking forward to getting out for a while now, and obviously still acclimatising to the UK cooler air setting off in his wind shell. Climb from Bleaberry Gill after Keith's face plant. We head west along the B6270 to warm up the legs before turning right into a very steep ascent at the little village of Healaugh. The scene is very picturesque at this early hour, mist still hanging low across the Swale valley you can begin to make out the mass of Harkerside across the river and point out where I had been riding just a couple of days ago. It’s nice to take view on a fell side and think, I was up there, always seeming a bit more impressive from a distance. 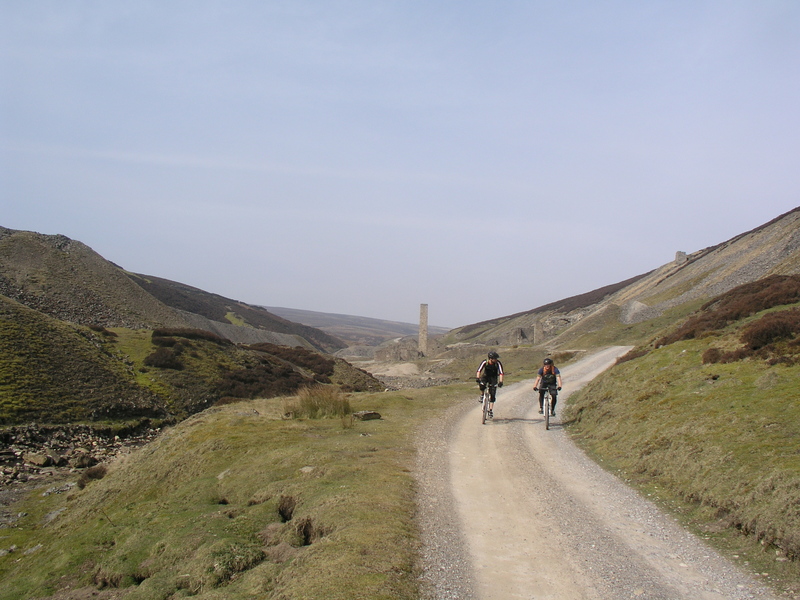 That’s the thing with Swaledale, you’re never to far away from somewhere you’ve ridden before or new trails you have yet to ride. 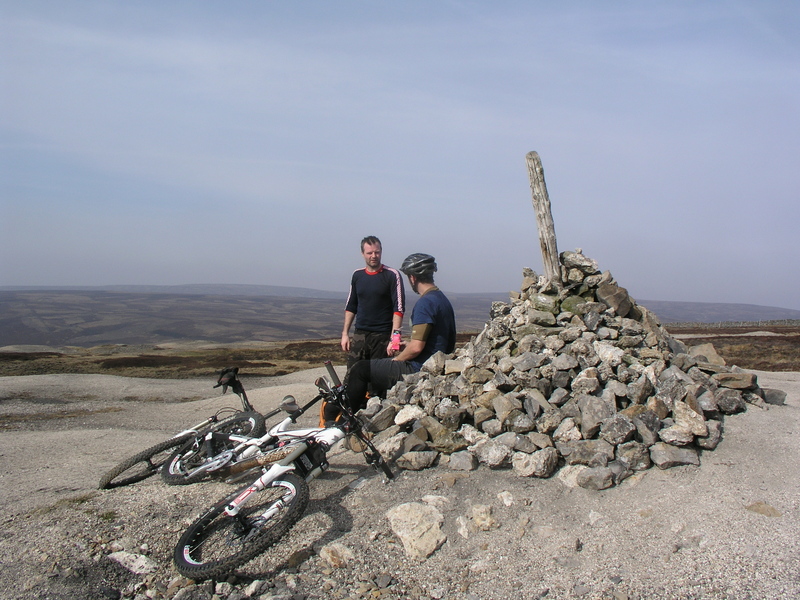 But they are already highlighted on the OS Map OL 30 Yorkshire Dales Central and Northern Areas. It’s a huge crisscrossing network of fantastic bridleways. 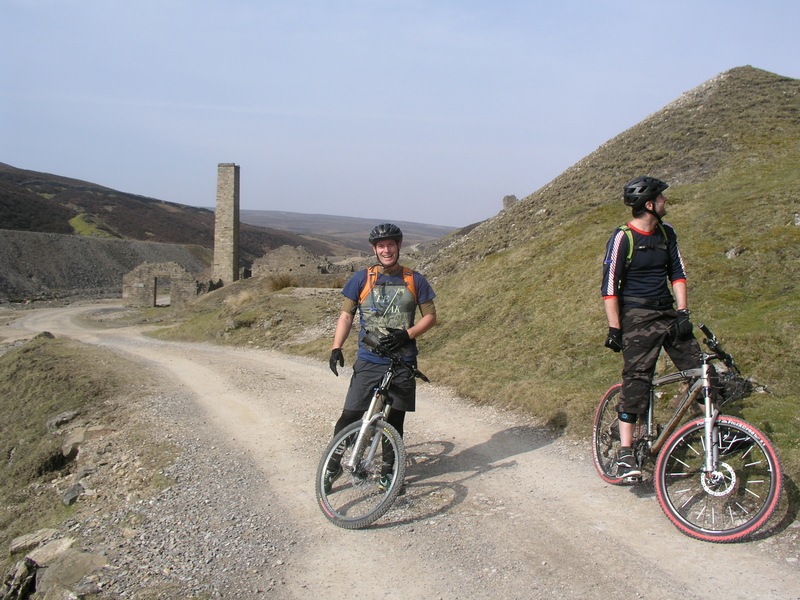 And there’s something for everyone, beginners as well as the more experienced will all find somewhere to ride off road. But there are so many trails it can be problematic for some like myself who is well known for not paying much attention to the land in front at least from a navigational perspective I’ll miss the trail that peels off to the right because I prefer to the one I’m on and this get get us a little wayward at times, and I submit to calling out the map for everyone to gather around. Collectively we tend to have bit of an idea where we are. This was the case when as I realised the trail seemed to take a downward approach a little too soon. We weren’t far off and picked up the bridleway but were still not far enough up the fell. This came as a relief for some. 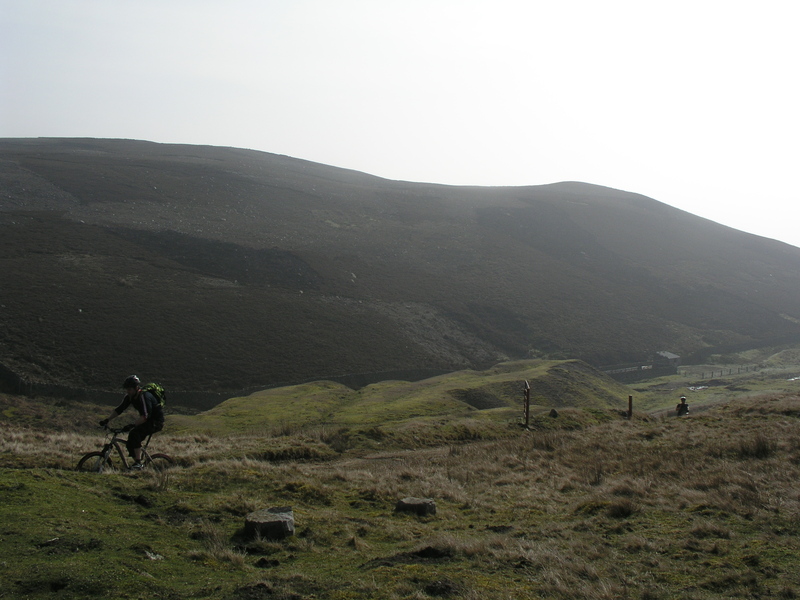 We rolled gently to Bleaberry Gill which on first impressions looked like a doable crossing. Mick took step stone precautionary method while Keith fancied a ride though which he did until the very last squared off river stone at the edge to stop him dead and throw him clean over the bars. He dismounted stylishly over the top to land very unstylishly on his face at the water’s edge covered in soft river verge brown stuff. 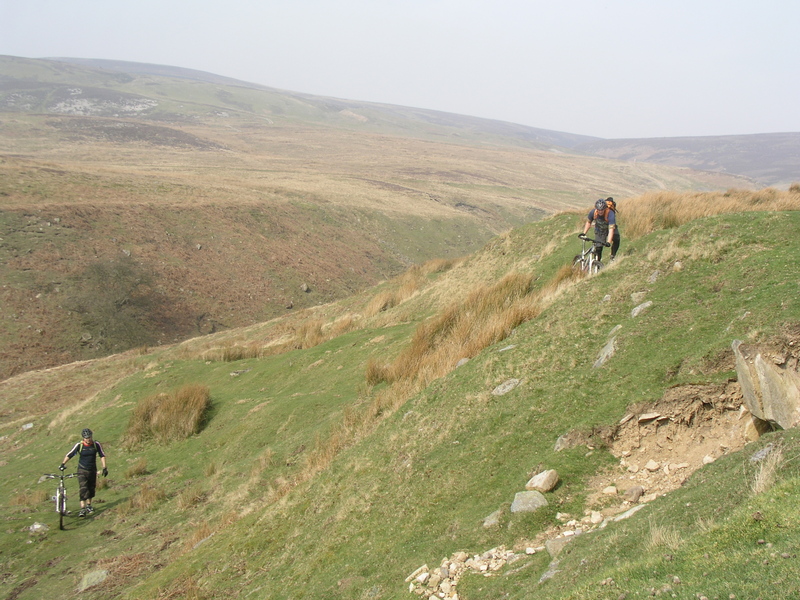 With the first CRASH out of way we set off steeply up to climb to Great Pinseat reached along a broad double track with vast views across Swaledale to the south and Arkengarthdale to the north. Grouse were everywhere I don’t like to think we spooked them but they are easily freaked out by anyone that gets within 50 meters of them, they make that distinctive raucous noise, which sounds a bit like a hyperactive child shaking one of those cow cans that you tip over to make a moo sound. I like grouse though, they remind my I’m somewhere remote and somehow they make me feel privileged to share the moors with them. Though they always do a better job of spooking me and often cause a bike wobble when I least need one. We pressed on at a nice leisurely pace swapping places occasionally and stopping for a couple of photos and just taking our time to the height of Great Pinseat. Topping out at 583 meters where you don’t quite expect the terrain to change so dramatically from lush heather to a moonscape with giant mounds of gravel. Keith’s suggestion of hiring a helicopter carrying tonnes of cement dust and dropping it before rainstorm was a genius idea of how we could turn it into our own Yorkshire version of Moab. Great! A pin and a seat. It's obvious really. We took the obligatory photos at the cairn and scoffed our personal biking bites then set off for the open descent to Level House bridge and then through the Old Gang Smelting mills. The smelt mill at Old Gang was built in the early years of the 19th century. Click here: This section was the highlight of the day. It’s not at all a techy trail but a wide open big ring bonanza of a track where you cover ground so quickly you find the ride is almost at its end and all over too soon. We bounded over the drain pipes spaced nicely apart, with speed and timing you have a great time practicing compressing your bike for long jumps, and without any concern for bends or corners. Even a couple of walkers could see us in plenty of time to step aside and give us cheery smiles as we zipped along in single file. Time to G.O.A.P, a ride wouldn't be a ride without a bit where you don't ride! Now referred to as Dismounting Biking. to cross the beck up to the wall to rejoin a grassy track. A little soft going from here made hard work on the legs. Mick was feeling it and dropped himself into the heather under the sun now at its warmest; it could have been a midsummer’s day in July. This is what we’d all been waiting for. Just to see the dust smoking off Mick and Keith’s tires earlier immediately transports me deep into summer. 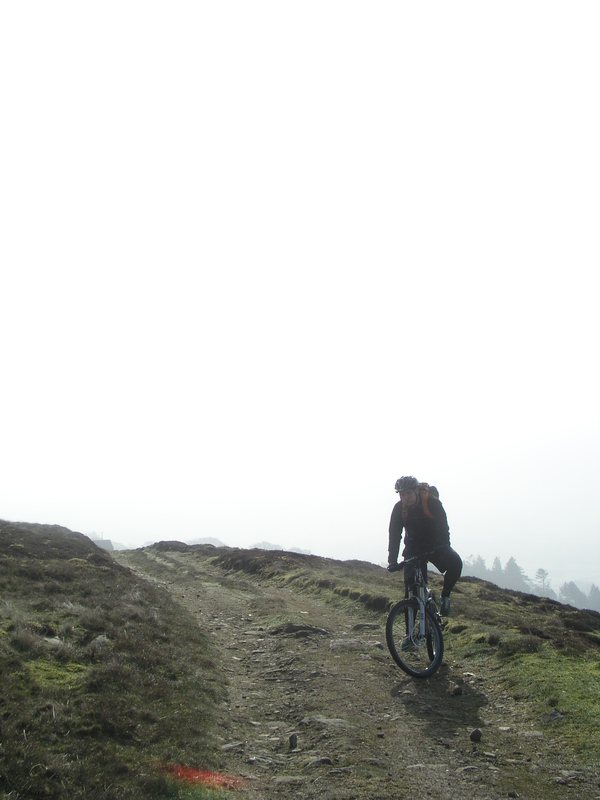 It’s one of those mind shots you remember for ages, and nothing beats it for the UK mountain biker. I’ve continued to persevere with the worst of the winter. It’s not been a bad winter but it’s been long. Next year I figure it’ll seem longer unless I forget the imagery of sunny days in the dales. I always come out of the simmer fitter than I went in. It’s too easy to sack a winter ride in favour of something else that’s not so much of a hassle really. It’s not that I don’t enjoy riding in the winter; I’d still rather ride in the rain and snow than do anything else at all other than ride in the sunshine of course. I think it’s the gear, thick gloves, biblongs, water-proof trousers and jackets, balaclavas and glasses that steam up in the rain and the wet muddy clothes. Being told off for trailing trail though the house on the way to the bathroom for that wee you’ve held in all-day. It’s the constant cleaning your bike while you stand with the hose in the back garden shivering because you’re not moving anymore and now you want to be warm, not pampered, just warm with a brew on. Today is what we want, every day we ride, just wearing shorts, t-shirts and shades. When Keith caught up we all jumped into the heather, arched belly up wearing our camelbaks. We can make beds from this heather we thought, it’s that comfortable, even luxurious. Most people would pay well to have their quilts at home smell like Yorkshire heather too, I’m sure my misses would go for it. Something like it will be on sale in Boundary Mills I’m sure. 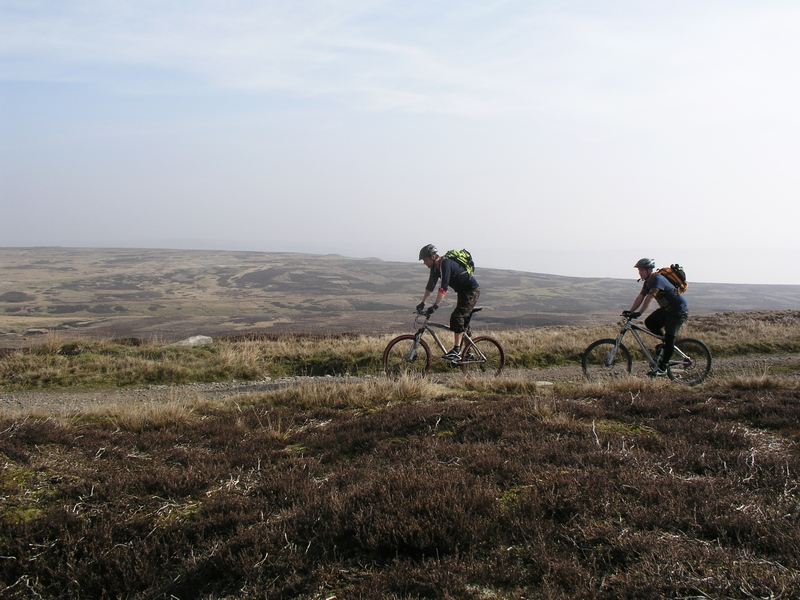 We chose well to pick the off road return to Reeth. A good variation of terrain, a grassy single track to double track to gravel track to grassy no track to stony boulder trail impersonating a stream track finally spitting us out onto the B6270 exactly where we started. 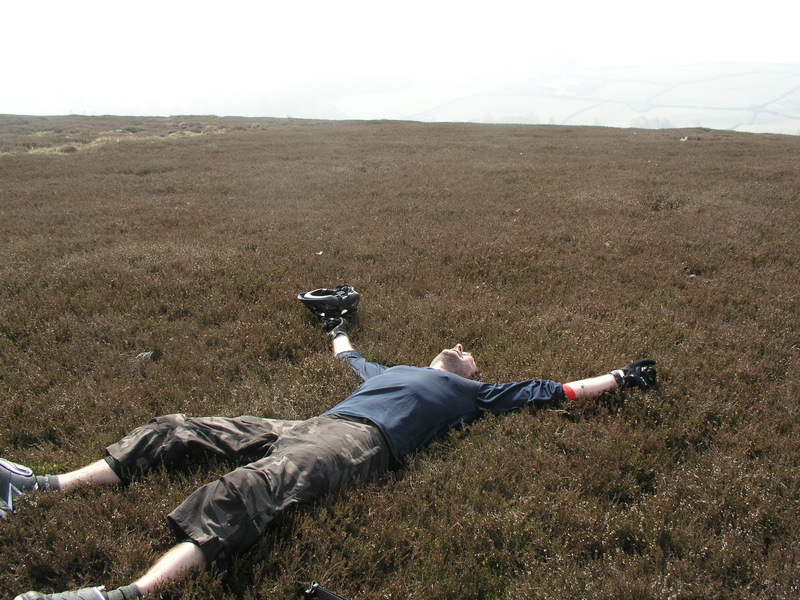 Mick picked up a slow pinch flat on the very last 50 yards before hitting the road into Reeth. This offered him a fantastic opportunity to tinker for a bit and by the time we were sitting down outside the Black Bull with a pint of Sheep his tire was flat. Brilliant! Back home for 14:00.